So with Volume 66 reaching some 170 postings, we should move on to this Volume 67. What is special on starting this new Volume is the fact that Artiger joined us in Volume 66. Artiger is a male physician (surgeon) verified by the Medscape medical website, where we both participate, who has provided us with the long-needed professional input and education from the outside of this blog. It appears that those writing to this thread have found his comments of interest and has accepted his presence here. I have no idea how long Artiger will stick around but as long as he decides to do so, I will find him most welcome as a significant contributor to the ongoing discussion. Here is Artiger's last posting from Volume 66. ..Maurice. Misty, participating in this blog simply reinforced my current practice. I work on the assumption that everyone cares about modesty. If you'll go back to my original comments (posted by Maurice on June 26 at 7:30am), you'll see what I am thinking about during an examination or procedure. When discussing breast incisions with women, I tell them about where the scar will be, and my method of closure to achieve the best possible cosmetic outcome. Many of them tell me that they don't care what it looks like, and I respond by telling them that I care what it looks like. I certainly understand if a female patient wants to drive another 100 miles or more to see a female surgeon. Like I said, I've got plenty more here that come to see me because of the service and courtesy I provide, not to mention how quickly I get them in to see me or get their procedure scheduled. Some people care more about that than gender. As an example I may have already mentioned, in an area we used to live, my wife drove 100 miles (past 2 female OB/gyn's) to see my best friend from medical school. Why? Because he gave her the best in care and service. I didn't have to convince her, seeing him was her idea. Never bothered either of us in the slightest, even when we would go visit them socially or take trips with them. Don, yes, discussing these issues and concerns are about half of the office visit. Although we don't shave (we use clippers) we don't remove any more hair than necessary, just enough to allow for a clear field for the proposed incision. As for catheters, that is always discussed ahead of time as well. Catheters are useful but they are not without their risks, and they are not to be taken lightly. No, the referring providers usually don't cover these things (they really wouldn't have a clue where to begin, I'll tell you candidly), as it's not their place to do so. That is what the office visit with me is for. If they could discuss all these things adequately then they could just call and schedule the procedure. I have never felt comfortable doing it that way, but there are a lot of places where you can get a colonoscopy without ever meeting the person who will do it. That's another part of my office visit that I feel is important...I want the patient to know me, who I am, what I look like, have all of their questions answered, and be comfortable with me as their surgeon. Thom, Robert A.: Paré. Photograph. Britannica Online for Kids. Web. 14 July 2014. 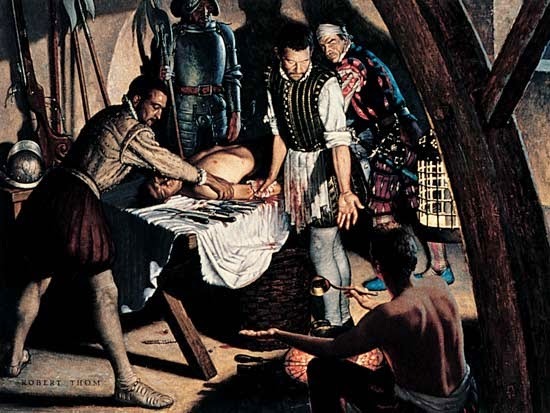 Ambroise Paré was a French army surgeon in the 1500s who invented compassionate ways to handle wounds and hemorrhages. The painting was done by Robert A. Thom in about 1954.